From the Star Wars collection by Think Geek. 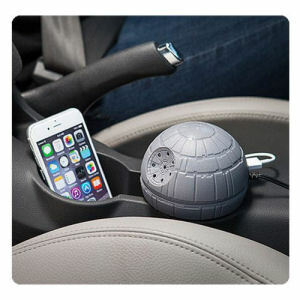 Star Wars Death Star USB Car Charger. From the Star Wars collection by Think Geek. Star Wars Death Star USB Car Charger. 2 charging ports (1 2.1 Amp and 1 1.0 Amp) - 3 volume settings - adjustable base. Charger measures about 4-inches in diameter and does not come with a USB cord. Ages 13 and up. Think Geek Star Wars Automotive shipping from Canada. No Surprise Border fees or Customs!